Back in the spring, when I sprang off my wall and broke my left arm, I told you about my homemade spring fall, I mean, spring rolls. I am happy to report that I am finally done with my therapy sessions ! Same technique, just a different filling : soy vermicelli, peppers, still in season, leftover chicken breast, and a very tasty peanut sauce, somewhat similar in taste to the classic hoisin sauce. If your peanut butter is organic like ours, with no added anything, there shouldn’t be any sulfites in it. I have made them twice already, 1) to perfect the sauce and 2) make sure my husband didn’t get sick ^^. Afterwards, I thought of other vegetables I could have included, such as the latest batch of green beans from our garden, or peanuts, provided they too were organic. Of course this recipe, like its predecessors, is versatile. I am just sharing some of the ideas that go from my head to our table, dear neighbors ! One last word on peppers : now is the time to stock up before they are not so readily available. Put them under your broiler, peel them after the skin has turned blistery and black and hand them over to your best friend, Mr Freezer, who will keep them for future use ! 1. Cook the vermicelli according to package instructions. Drain and cut up small. Combine with cut up grilled peppers. 2. Prepare the sauce, first mixing the peanut butter and the agave nectar, and then gradually adding the tamari sauce and water. Quantities may be adjusted according to taste, keeping in mind that the end result should be more of a paste than a liquid. 3. For each roll, soften a rice sheet in a skillet filled with warm water. Lay on a plate and place one leaf of lettuce. Spread some of the sauce over the leaf, then top with vermicelli and vegetables. Dip the protein into the sauce and place in the middle. You can also choose to simply spread more sauce over the filling. 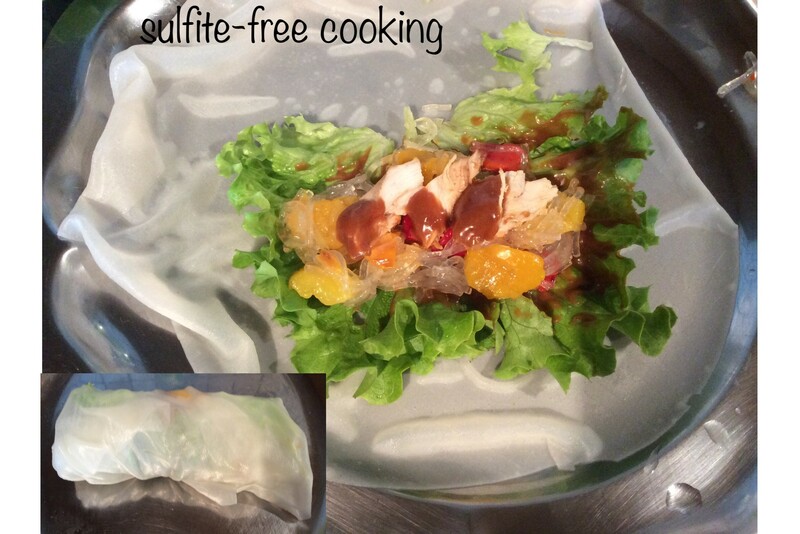 Roll as you would a regular spring rolls, using the lettuce lining of the rice sheet to contain the filling. I roll from the bottom up about half way, then fold in the sides and finish rolling upwards. Done ! Enjoy, dear neighbors! I am so glad to hear that you are out of therapy and regaining full function! And what a lovely recipe to celebrate it! Thank you, Dolly 😊. I am also very happy not to have to be on the road so much to drive to the therapist’s office. It was time well spent though. I will keep doing some of the exercises in the comfort of my home in order to maintain my arm’s newly found mobility . Given my legendary clumsiness, my husband had better stay out of my way as I swing a stick left and right behind my back 😄 ! LOL I love your cheerful outlook on this misadventure! I’m glad to hear that you’re back to yourself! One handy tip for fussy eaters is to blend the bell peppers and freeze them in ice-cube trays. You can just toss them in casseroles and curries with no worries about lumps. I can’t eat them myself, but all the ones that grew his year were blitzed and frozen. Take care. We heard, of course, about the bad storm that hit the west coast of Ireland. Even if you live inland, I suppose you had some very strong winds. Any damage in your garden? I hope not, dear neighbor. We were very lucky. It was wild, but aside from the greenhouse door falling off early on, it’s very loose, which was promptly shoved back on and held with a wheelbarrow, everything is mostly fine. We didn’t even lose electricity. Must have been scary. Glad everything is ok then. Take care.